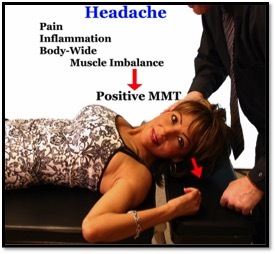 Given the co-variance of muscle inhibition found in patients with headaches and the cost of headaches to both individuals and society at large, it cannot be stressed enough that MMT should become part of every clinician’s assessment of patients with headache. · Reduced range of motion: Reduced range of motion, usually due to muscle inhibition, is well documented in these patients; and current classification criteria for cervicogenic headache include restricted range of motion of the cervical spine. (16-17,24) Individuals with high pain-related fear also have smaller excursions of cervical spine. This evidence suggests that the MMT is potentially a sensitive and specific test for evaluating cervical spine muscular impairments in patients with mechanical neck pain. Using a 95% confidence interval, we estimated that between 88.8% and 97.2% of all patients with mechanical neck pain have positive MMT findings in one or more of the four muscle pairs tested. In 1991 Lund et al. (28) described the pain adaptation model, reviewing the muscular changes in five chronic musculoskeletal pain conditions (muscle tension headache, TMJ dysfunction, fibromyalgia, chronic lower back pain, and post-exercise muscle soreness). Lund determined that these types of musculoskeletal pain disorders are not due to the older model of pain-spasm-pain cycle; instead, these conditions are mediated by the CNS as inhibition of the agonists and hypertonicity of the antagonists. Deficits in strength, endurance, and increased fatigability have been consistently demonstrated in the muscles that attach to the cranium in patients with whiplash-associated disorders, neck pain; and headache, using many different muscular assessment techniques. Recent studies by Nederhand et al have confirmed that cervical muscle dysfunction appears to be a general sign in diverse chronic neck pain syndromes, especially related to whiplash injuries. (45-46) These studies suggest that the performance of the upper trapezius muscle is an invaluable diagnostic measurement in the evaluation of patients with chronic neck pain and chronic whiplash-associated disorders. Cervicogenic headaches involve not only altered biomechanics, psychosocial anxieties, as well as significant costs to society, but also measurable motor control errors and local as well as remote muscular dysfunction that are part of the nervous system’s response to pain and dysfunction. Help support freedom of alternative health information! During the past 3,000 years many diagnostic methods have been developed to discover the causes of human pain. In l972, a significant step forward in the evaluation of neurological disturbances related to functional-structural impairments was made by Goodheart. (48) The system consists of the examiner manually pressing on the vertebra in various directions and locations, and immediately testing a muscle to determine change of strength. Goodheart named this procedure the "vertebral challenge." It has been widely used by doctors practicing applied kinesiology, and by thousands of other clinicians and therapists around the world who practice some portion of the applied kinesiology methodology, with significant success. It provides the opportunity for evaluating chiropractic subluxations, joint dysfunctions, osteopathic lesions, and body-wide articular dysfunctions in an effective, efficient manner. The challenge method is the one used in applied kinesiology to determine the precise vector of any manipulative treatment. When the challenge is applied to an abnormally functioning vertebra, a skeletal muscle associated with the dysfunction will become temporarily very strong, as observed on manual muscle testing, for a period of many seconds to minutes. Because MMT identifies neuromuscular dysfunction in the muscle, the directional preference of a local or remote joint dysfunction can be identified by applied kinesiology challenge. (12) If the sternocleidomastoid muscle on the right is inhibited (and related to a suspected cervical joint dysfunction and headache), a challenge of the C6 vertebra from lateral to medial may immediately strengthen the sternocleidomastoid. This is the subluxation responsible, and the direction necessary for correction, of the sternocleidomastoid muscle impairment. Sensorimotor “challenge” is a diagnostic procedure unique to Applied Kinesiology manual muscle testing that is used to determine the body’s ability to cope with external stimuli, which can be physical, chemical, or emotional. After an external stimulus is applied, muscle-testing procedures are done to determine a change in the muscle strength as a result of the stimulus. The most common reason for muscle inhibition (an inability to generate adequate force for the optimal execution of movement) is direct physiological and pathological changes to the muscle’s innervation. In recent years, both chiropractic and manual medical research and theory have highlighted the role of muscles, joints, and nerves in the function of the neuro-musculoskeletal system. This system has been described as the Primary Machinery of Life(49) as it is how we, and all tissues within us, move and communicate. If we are not capable of diagnosing this fundamental problem in the muscles of the head and neck, we are missing a fundamental component of headache dysfunction, thereby making the treatment of this complex neuromusculoskeletal pain disorder that much more difficult. Several hundred studies have shown that cervicogenic or tension-type headache pain is associated with muscle inhibition, the detection of which makes MMT for cervicogenic headache and neck dysfunctions invaluable in clinical practice. Functional pathology of the muscle system is the most common clinical finding in tension-type and cervicogenic headache pain patients presenting to chiropractors, osteopaths, neurologists, rheumatologists, orthopedists, massage and physical therapists. (16) Yet this disorder of the muscle system is routinely ignored in the diagnosis and treatment of these patients. In the triad of health model of health care (namely holistic and integrative health care), many factors that disturb and influence muscle function in the head and neck may be “challenged” or “therapy localized,” including joint dysfunctions, reflex points, lymphatic and vascular receptors, meridian points, cranial dysfunctions, the origin and insertion of the muscles, proprioceptors within the muscle, myofascial kinematic interconnections with the lower body, foot and gait disturbances, and many more. Each of these elements in the patient’s adaptation to injury or pain must be addressed if an integrated, holistic and interdisciplinary method to manage the complexities of headache pain is to be realized. Dr. Scott Cuthbert is the author of Whiplash Dynamics and Manual Muscle Testing (2017), Applied Kinesiology Essentials: The Missing Link in Health Care (2013), and Applied Kinesiology: Clinical Techniques for Lower Body Dysfunctions (2013), the content of which forms the basis for this article. Dr. Cuthbert is a 1997 graduate of Palmer Chiropractic College (Davenport) and practices in Pueblo, Colorado. He has published 13 Index Medicus clinical outcome studies and literature reviews, and 50 peer-reviewed articles on chiropractic and manual muscle testing approaches. 1. Fernandez-De-Las-Penas C, Arendt-Nielsen L, Gerwin RD. Chapter 4: The Nature of Muscle Pain, In: Tension-Type and Cervicogenic Headache: Pathophysiology, Diagnosis, and Management. Jones & Bartlett Publishers, Sudbury, MA: Boston; 2010: 33-50. 2. Janda V. Muscles and motor control in cervicogenic disorders. In: Grant R. (Ed.) Physical therapy of the cervical and thoracic spine. Churchill Livingstone: New York; 1994. 3. Panjabi MM. A hypothesis of chronic back pain: ligament subfailure injuries lead to muscle control dysfunction. Eur Spine J. 2006 May;15(5):668-76. 4. Lewit K. Pathomechanisms of cervical headaches. Psychiatr Neurol Med Psychol (Leipz). 1977 Nov;29(11):661-71. 5. Jull G, et al. Chapter 4: Alterations in cervical muscle function in neck pain. In: Whiplash, Headache, and Neck Pain. Elsevier: Edinburgh; 2008:41-58. 6. Goodheart GJ, Jr. Applied Kinesiology Research Manuals. Privately published yearly. Detroit, MI; 1998-1964. 7. Saper JR. Headache disorders. Med Clin North Am. 1999 May;83(3):663-90. 8. Dennison BS, Leal, MH. Mechanical neck pain. In: Neck and Arm Pain Syndromes. Eds. De las Penas et al.Elsevier; 2011:97. 9. Haldeman S, Dagenais S.Cervicogenic headaches: a critical review. Spine J. 2001 Jan-Feb;1(1):31-46. 10. World Health Organization, 2015. Headache Fact Sheet. Available at: http://www.who.int/mediacentre/factsheets/fs277/en/. 11. Simmonds MJ, et al. Psychometric characteristics and clinical usefulness of physical performance tests in patients with low back pain. Spine. 1998;23(22):2412-2421. 12. Cuthbert S. Applied Kinesiology Essentials: The Missing Link in Health Care. The Gangasas Press: Pueblo, CO. 2014: 41-78. 13. Szeto GP, Straker LM, O'Sullivan PB. A comparison of symptomatic and asymptomatic office workers performing monotonous keyboard work--1: neck and shoulder muscle recruitment patterns. Man Ther. 2005 Nov;10(4):270-80. 14. Murphy DR. Conservative management of cervical spine syndromes. McGraw Hill: New York; 2000:441-482. 15. Foreman SM, Croft AC. Whiplash Injuries: The Cervical Acceleration/Deceleration Syndrome (Ed. 3). Baltimore, Lippincott Williams & Wilkins Co., 2002:335-428. 16. Cuthbert SC, Rosner AL, McDowall D. Association of manual muscle tests and mechanical neck pain: results from a prospective pilot study. J Bodyw Mov Ther. 2011 Apr;15(2):192-200. 17. Jull G, et al. Cervical musculoskeletal impairment in frequent intermittent headache. Part 1: Subjects with single headaches. Cephalalgia. 2007 Jul;27(7):793-802. 19. Dumas JP, et al. Physical impairments in cervicogenic headache: traumatic vs. nontraumatic onset. Cephalalgia. 2001 Nov;21(9):884-93. 20. Watson DH, Trott PH. Cervical headache: an investigation of natural head posture and upper cervical flexor muscle performance. Cephalalgia. 1993 Aug;13(4):272-84; discussion 232. 21. Cyriax E. On Weakness of the Posterior Cervical Muscles as a cause of Headache. Medical Press and Circular 1920, N.S. cviv:461-463. 22. Dvir Z, Prushansky T. Cervical muscles strength testing: methods and clinical implications. J Manipulative Physiol Ther. 2008 Sep;31(7):518-24. 23. Falla D, et al. Neuromuscular efficiency of the sternocleidomastoid and anterior scalene muscles in patients with chronic neck pain. Disabil Rehabil. 2004 Jun 17;26(12):712-7. 24. Sjaastad O, Fredriksen TA, Pfaffenrath V. Cervicogenic headache: diagnostic criteria. The Cervicogenic Headache International Study Group. Headache. 1998 Jun;38(6):442-5. 25. Revel M, Andre-Deshays C, Minguet M. Cervicocephalic kinesthetic sensibility in patients with cervical pain. Arch Phys Med Rehabil. 1991 Apr;72(5):288-91. 26. Treleaven J, Jull G, Sterling M. Dizziness and unsteadiness following whiplash injury: characteristic features and relationship with cervical joint position error. J Rehabil Med. 2003 Jan;35(1):36-43. 27. Treleaven J, Jull G, Atkinson L. Cervical musculoskeletal dysfunction in post-concussional headache. Cephalalgia. 1994 Aug;14(4):273-9; discussion 257. 28. Lund JP, et al. The pain-adaptation model: a discussion of the relationship between chronic musculoskeletal pain and motor activity. Canadian Journal of Physiology and Pharmacology. 1991;69:683-694. 29. Stapley PJ, et al. Neck muscle fatigue and postural control in patients with whiplash injury. Clin Neurophysiol. 2006 Mar;117(3):610-22. 30. Michaelson P, et al. Vertical posture and head stability in patients with chronic neck pain. J Rehabil Med. 2003 Sep;35(5):229-35. 31. Carvalho GF, et al. Balance Impairments in Different Subgroups of Patients With Migraine. Headache. 2017 Mar;57(3):363-374. 32. Quek J, et al. An exploratory study examining factors underpinning postural instability in older adults with idiopathic neck pain. Gait Posture. 2017 Nov 16;60:93-98. 33. Falla D, Jull G, Hodges PW. Feedforward activity of the cervical flexor muscles during voluntary arm movements is delayed in chronic neck pain. Exp Brain Res. 2004 Jul;157(1):43-8. 34. Treleaven J. Dizziness, Unsteadiness, Visual Disturbances, and Sensorimotor Control in Traumatic Neck Pain. J Orthop Sports Phys Ther. 2017 Jul;47(7):492-502. 35. Malmström EM, et al. Cervicogenic dizziness - musculoskeletal findings before and after treatment and long-term outcome. Disabil Rehabil. 2007 Aug 15;29(15):1193-205. 36. Register-Mihalik J, et al. The effects of headache on clinical measures of neurocognitive function. Clin J Sport Med. 2007 Jul;17(4):282-8. 37. Cuthbert SC. What are you doing about muscle weakness? Dynamic Chiropractic. 2009;27(25). 38. Cuthbert SC. What are you doing about muscle weakness? Pt. 2, Cervical spine. Dynamic Chiropractic. 2009;27(25). 39. Cuthbert SC. What are you doing about muscle weakness? Pt. 3, Lumbar spine. Dynamic Chiropractic. 2009;27(25). 40. Cuthbert SC. What are you doing about muscle weakness? Pt. 4, The extremities. Dynamic Chiropractic. 2009;27(23). 41. Cuthbert SC, Goodheart GJ Jr. On the reliability and validity of manual muscle testing: a literature review. Chiropr Osteopat. 2007;15(1):4. 42. Cuthbert S, Blum C, Rosner AL. The association of manual muscle tests and treatment outcomes with headache and cranial dysfunctions: A retrospective case-series report. Altern Ther Health Med. 2018. In Press. 43. Cuthbert S, Walther DS. Whiplash Dynamics and Manual Muscle Testing. Chapter 1: Manual Muscle Testing and Whiplash Associated Disorders. The Gangasas Press: Pueblo, CO. 2017:1-18. 44. Falla D, et al. Myoelectric manifestations of sternocleidomastoid and anterior scalene muscle fatigue in chronic neck pain patients. Clin Neurophysiol. 2003 Mar;114(3):488-95. 45. Nederhand MJ, et al. Chronic neck pain disability due to an acute whiplash injury. Pain. 2003 Mar;102(1-2):63-71. 46. Nederhand MJ, et al. Cervical muscle dysfunction in chronic whiplash-associated disorder grade 2: the relevance of the trauma. Spine. 2002 May 15;27(10):1056-61. 47. Schmitt WH Jr, Cuthbert SC. Common errors and clinical guidelines for manual muscle testing: "the arm test" and other inaccurate procedures. Chiropr Osteopat. 2008 Dec 19;16:16. 48. Goodheart GJ Jr. The Cervical Challenge. Chiro Econ. 15(2); Sept-Oct 1972:36-39. 49. Korr I. Osteopathy and medical evolution. Holistic Medicine. 1988;3:19-26.